The brothers agreed and said, “We shall try our best to complete each and every job given to us.” Both the brothers worked hard. Slowly and steadily, months passed and one day one of the brothers said, “Tomorrow is the last day of the year.” The other said, “You mean the day has come when we will get our wages.” They were happy that they would have twenty-four gold coins and we could go home. Also, read Shekh Chilli Story. Image Source–> gamesvideoreview.net. The next day in the morning, the brothers went to the miser. “Sir, we have done every task you set. Will you please pay our wages? We’ll leave for our home.” The miser said, “The day is not yet over. There’s a long way to go. I have three more tasks for you. 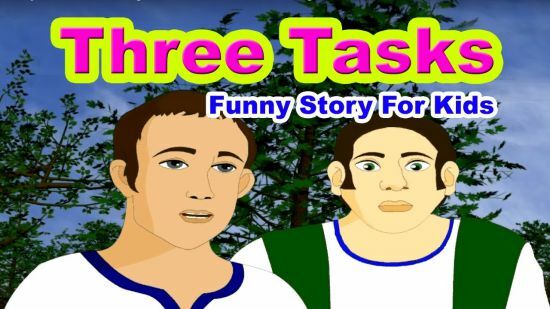 Complete it and get your wages.” The boys became curious about their tasks. The brothers came to know that they had been cheated. The miser wanted his work to be done without spending anything. But the elder brother had an idea to trick miser and decided to teach him a lesson. They decided that they would complete these tasks and would get their wages. And soon after that, they completed their first task. They put the larger jar inside the smaller one by breaking the larger glass jar. They called the miser and he could do nothing but to agree with the brothers. Soon, there was a noise coming from the roof of the house. The miser ran out of his house and said, “What are you doing on my roof?” The younger brother told him that he was taking down the roof so that the sun could enter the room and dry the grains. The miser told him to stop and considered the second task completed. The scared miser immediately gave twenty-four gold coins and ran to his home. He had to admit defeat. You may also like to read, The Bald Man And The Fly.